More of a learning curve than I anticipated this season, growing in a new pumpkin patch. 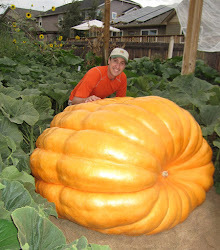 The season isn't quite done because tomorrow we will be cutting the pumpkin from the vine and loading it onto a trailer to take to the Thanksgiving Point weigh-off on Saturday, but the growing is done now. Extra fertilizing I did this year I think had an effect on growth. Need to get my sprinkler system installed next year. Watering was uneven with the single sprinkler head watering the patch. Time was an issue this year and we'll get that corrected next year. About 5 degrees of extra warmth would make a big difference in growth. Using data from my temperature sensor I looked at how often the plant was under 54 degrees or above 91 degrees in August. A little more than 1/4 of the time the plant was outside those growing range temperatures. So pretty much 1/4 of the time the pumpkin wasn't growing at all. The 747 Johnson seed is a good seed. I loved the pumpkin's long shape (reduces the potential for splits) and smooth skin. Vine growth was fairly aggressive. Hopefully it carries the heavy gene. This plant went through a lot this year and things turned out okay regardless. Earyly season growing is a challenge. I got lucky this year. Started my seeds early and pollinated early, but 6 degrees cooler one day and I would have lost the 747 plant. Last frost was earlier than average, so I need to figure out a way to work with environment and mitigate risk with the plants a little better.